With the developing landscape of a European criminal justice sphere comes an increasing imperative for scholars and practitioners to gain some insight into the diversity that exists in the criminal justice systems of European Union Member States. 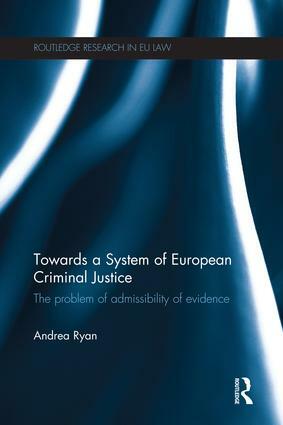 This book explores the mutual admissibility of evidence; a facet of EU criminal justice that is proving difficult to realise. While the Lisbon Treaty places the issue of mutual admissibility of evidence squarely on the agenda, the EU instruments to date have not succeeded in achieving this goal. Andrea Ryan argues that part of the reason for this failure is that while the mutual recognition instruments have focussed on the issue of gathering evidence and safeguarding suspects’ rights, they have not addressed how evidence is to be presented and contested at trial. Drawing upon case studies from Ireland, France and Italy, and adopting a legal cultural perspective, and enriched by the author’s observations of criminal trials, the book presents a detailed analysis of the developments to date in EU criminal justice and evidence law. By examining evidence practices the book asks whether the inquisitorial and accusatorial traditions within the EU systems are too irreconcilable to achieve a system of mutual admissibility of evidence. The book will be of great interest and use to academics and practitioners with an interest in European and comparative criminal justice, criminal procedure, human rights and socio-legal studies. Andrea Ryan is a lecturer in the School of Law at the University of Limerick, Ireland.